Drug Detection Searches are successful in proving that not much can be hidden from the dog. Unlike other canine units our dogs are also proficient at detecting residual odours and residue. Locating areas where substances are used or stored although actual substance has been removed, can be an invaluable tool in identifying problem areas or persons. Using a trained drug detection dog allows large areas to be searched in less time. The is no need to add additional man hours. As an example a K9 team can inspect as many as 1400 lockers in as little as 70 minutes. A similar search without a detection dog would take approximately 2 weeks and not equal the dog’s thoroughness. 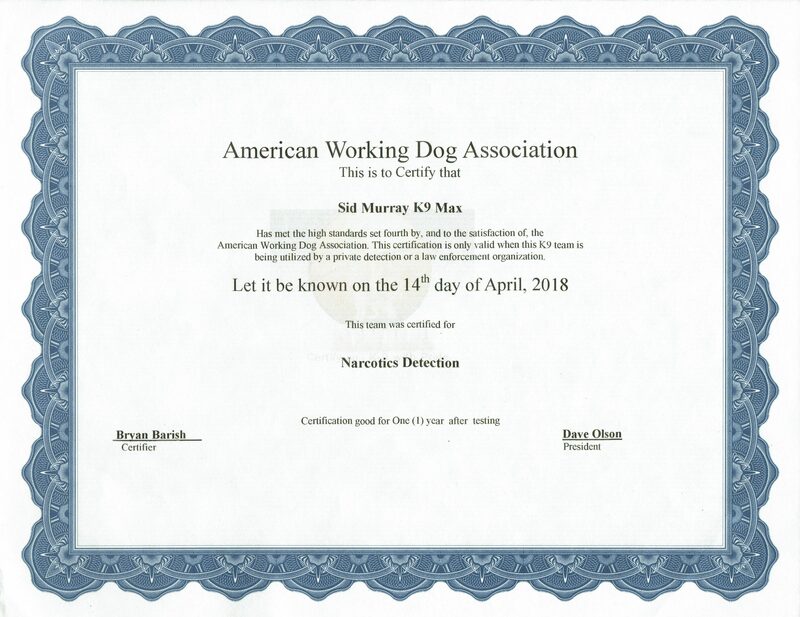 Our dogs attend many workshops and seminars during the year to sharpen their skills and are certified yearly with and independent tester from American Working Dog Association. All searches are conducted with confidentiality. What substances can be detected? Our drug detection dogs are trained to identify the following substances. Although it is impossible to train for all chemical substances. Pharmaceutical companies often alter the formulas making it difficult. Our dogs are also trained to alert on the source of the odour. During a search the dog may indicate on paraphernalia such as pipes, pens, paper clips, bottles or residual odour etc. Some clients request dogs to be trained on additional smells. In some instances when substances are located field testing maybe required. We suggest NIK drug test pouches or Mistral test kits for testing samples. All of our dogs are trained, tested and certified annually on 5 standard odors. 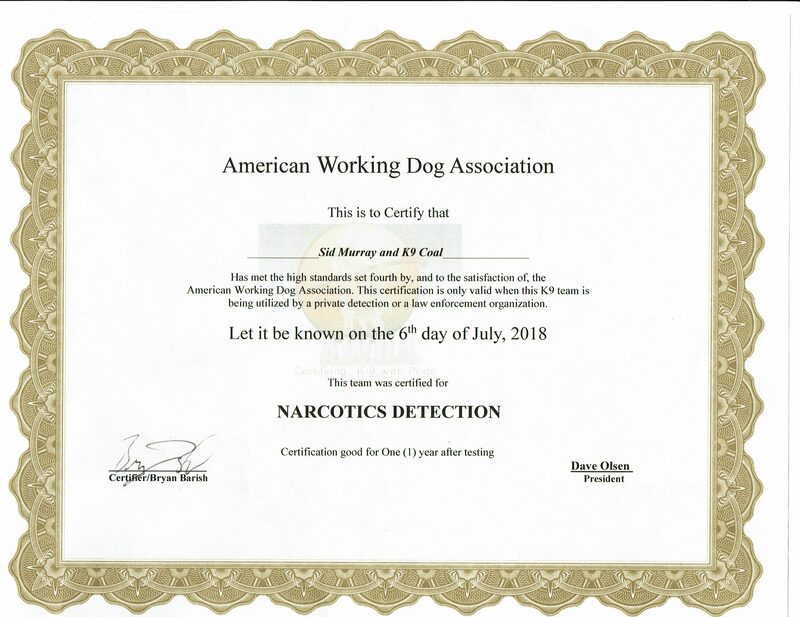 The standard odors are: marijuana, heroin, cocaine, crack cocaine, methamphetamines by a nationally recognized, unbiased, independent testing organization – American Working Dog Association. We hand select and train each dog for trained for 6 to 8 weeks in the areas obedience and odour recognition concentrating on 5 industry standard odours. Additional odours are trained by client request. Once the dog has completed training the handler would come in for a 7-10 day K9 team integration course. During this time the handler is taught how to properly interact with the dog based on obedience, scent recognition and indication acknowledgement. This is an extensive training course. Conducting drug searches are physically and mentally challenging. It is important that the dog and handler are fit for the work. Our rigorous screening requires the selection of dogs to be clear of physical and psychological defects. To make sure that your K9 team is a top performer we recommend our clients use similar standards in selecting a handler. The dogs we have for sale may be male or female. We base our selection on the performance capabilities of the individual not gender. Dogs are between 1-3 years of age. All detection dog candidates undergo extensive environmental and social testing to assure soundness. Some contraband our dogs have found. All finds have been turned over to Law Enforcement. All searches are conducted with confidentially.